Experiment Farm: Have You Seen Jesus Today? 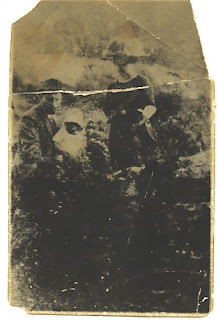 Sent by Jessica Lundgren from Sweden to paranormal.about.com, you can see the clear profile of a giant bearded man with closed eyes. It does resemble common representations of a fellow named Jesus. Even though that enormous Jesus head doesn’t quite fit into the rest of the image. What’s going on there? Jessica writes that “the child died short after the photo was taken”. If you look carefully you may recognize that the photo is of a Victorian couple, with a small child sitting on the knee of the man.